Unless I start springing a few grand for ancient rums from the 1920s and 1930s, this is likely to be the oldest Bally rum I’ll ever see, or try. I suppose I could take a stab a guessing how truly old it is – who knows, maybe it’s in the fifteen year range too? – but for the moment I think I’ll just revel in the fact that it was made almost sixty years ago, way before I was born, by Jacques Bally’s boys before the estate shut down in the late 1980s and the production shifted to St. James. And who among us doesn’t enjoy revisiting rums made in ages past? A piece of the living history of our parents is what it really is. Too bad they weren’t into rums as much as we are. Nose – The modern agricole profile is something of an afterthought on the nose. It smells salty and Haagen-Dasz carmel creamy; not really grassy or vegetal, more olive-y and brine and some paint stripper (the good kind). Some of the mineral (or ashy) background of the 1975 is also on show here, plus some weird green peas, overripe bananas and off-colour fruits sitting in an over-sterilized hospital. It’s crazy odd, emphatically different and shouldn’t really work….yet somehow it does. 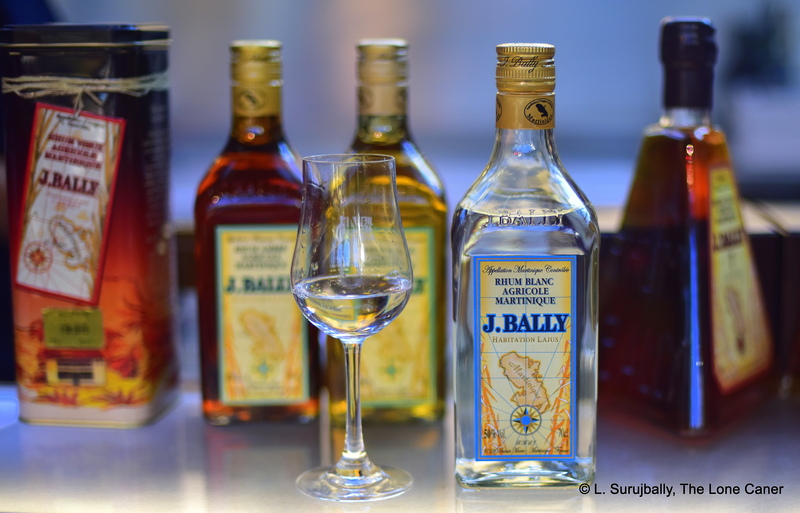 Palate – The tastes which remind me of more recent vintages coil restlessly beneath the surface of this rhum, occasionally emerging for air to showcase grass, green grapes, sugar cane sap and soursop. Heavier, muskier flavours tie all of them together: prunes, peaches, pineapple, cinnamon, apples and the interesting thing is, it’s hardly sweet at all. Plus, the ashy, minerally taste remains (let’s call it “dirt” or “earth” or “sod”), which is not entirely to my liking, although it does succeed in balancing off the other components of the profile. Let’s call it intriguing at least, and hauntingly good at most. Finish – Medium long, much of the palate comes back to take another bow before exiting stage left. Tropical fruits, some earth again, a flirt of breakfast spices, licorice and tannins. Pretty good, actually. Thoughts – Parts of the rhum work swimmingly. The balance is a bit off, and overall, I felt it had many points of similarity with the 1975, with a few marked deviations too. What this says to me is that no matter which era (or where) Bally rhums were made in, there is an awesome dedication to consistency over the decades. The Bally 1960 would not be out of place on today’s shelves, and it would surely be better than many. Yes, the other Rumaniacs have also written about this rhum, and for the record, they all scored it at 90+. We’re going back down memory lane now, to a point where the AOC designation is a dream on the horizon, and for once we have an age: this rum is sixteen years old (based on the bottom of the bottle where it says “Bottled February 1991” in French). This of course leads us to puzzle our way through all the others we’ve looked at already, because if here they can call a 16YO a “rhum vieux” then the other Bally rhums are in all likelihood similarly aged – we just have no proof of the matter. In any event, age or no age, rums and rons and rhums are evaluated based on what they are, not what they are stated to be. So let’s put aside all the whinging about information provision (which is a never ending grouse of mine) and simply taste a rhum made when I was still living in Africa and had never heard of Martinique (or much about Guyana, for that matter). Nose – So far nothing has beaten the Bally 1982, but this one is on par…perhaps better. The nose is amazing – deep purple grapes and vanilla, with the traditionals of sugar cane sap, wet green lemon grass, with a mischievous hint of wet cardboard and cereals. Threading through these smells are additional notes of Turkish coffee (no sugar), cocoa and some black chocolate, but curiously there’s less fruitiness to sniff in this one than in the later editions, and it’s backgrounded by something vaguely metallic…like licking a small battery, y’know? Some cinnamon, well-polished leather and honey fill in the spaces. Palate – It’s creamy, spicy, sweet and salty all at once (plus lemon). In a way it reminds me of a very well made Thai green curry in coconut milk. The fruits are here at last – green apples, pears, white guavas, but also pastries and cheese, to which are added very light hints of creme brulee and caramel, milk chocolate, some honey and licorice. Would be interesting to know the barrel strategy on this one. Whatever. It’s a fine fine rhum to try, that’s for sure. Finish – Medium long, vegetal, grassy and breakfast spices for the most part, some more of the white fruit, and the woody notes are here to stay. Not the best fade, but pretty good anyway. Thoughts – It had great balance and the tastes were excellent. 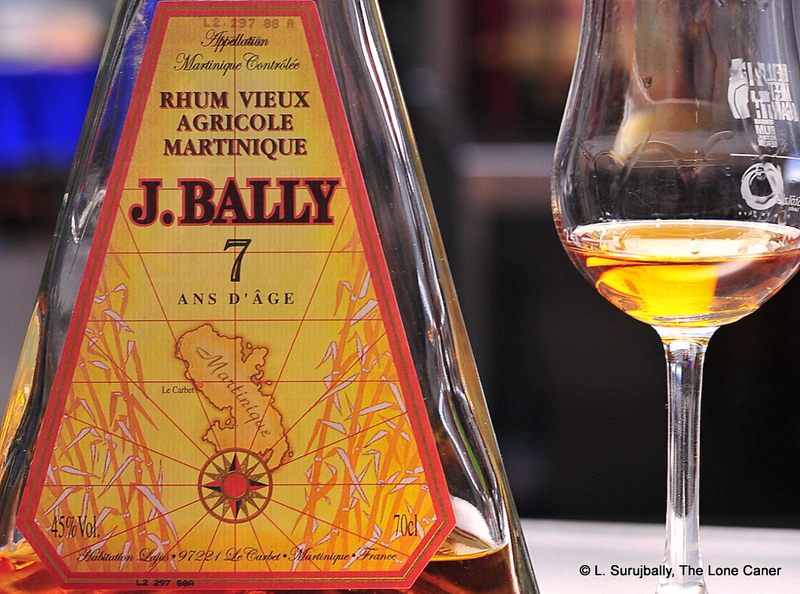 Something like this is best had in conjunction with something newer from Bally because then you gain a sense of its achievement, and how rhum has developed over the years. People swear by the AOC (and in an era of marketing nonsense dosed with outright lies, quite rightfully so), but sometimes you wonder whether something hasn’t been lost as well. The Bally 1975 emphatically demonstrates the quality of what was being done, at a time way before regulations changed the industry. The boys of the Rumaniacs liked this rhum even more than I did. We’re slowly moving past the more recent vintages of the Bally rums and into something not necessarily older, but bottled from longer ago. Hopefully they’ll throw some light into the development of the profile over the years. The quality of the older expressions is not necessarily or always better just because it was made thirty five years ago…but yeah, perhaps in this case it is. The 1982 is certainly one fine piece of work, made at the original Bally site before the distillery closed in 1989 and production was shifted over to Simon. Nose – Oh, so nice. A smorgasbord of fruity notes right away – raisins, blackberry jam, candied oranges, plus coffee, anise, caramel bonbons and some breakfast spices (and cumin, oddly enough). It presents as sweeter than the 1992 and 1993 variations, and also somewhat more musky, salty, with those wet earth aromas being quite distinct, though fortunately not aggressive…more like an underlying bed upon which the other smells were dancing. Palate – Warm, delicious, sweet and salty, like a Thai vegetable soup with sweet soya. After opening up some, the fruits take over – berries, cherries, jammy notes, nougat, light florals. Loads of complexity here, well balanced against each other. There’s the earth tones again, some black tea, bananas, light citrus. None of the flavours are dominant, all rub against each other in a cool kind of zen harmony. One odd thing here is that the grassy and sugar-cane sap part of the profile is very much in the background and nowhere near as clearly discernible as modern agricoles lead us to expect. Finish – Long and faintly sweet. There was actually some anise and coffee here (and was that molasses? …naah). Long on spices like cinnamon, cloves and cumin, and the warm wet earth component, which I’ll say is Jamaican even though it isn’t, made one last bow on the stage. Thoughts – I dearly wish I knew how old the rums truly was. It’s labelled as an AOC, but that classification only came into force in 1996, so is it possible that the 1982 is at least 14 years old? I simply don’t know. Perhaps it’s just as well. Like it or not, we sometimes unconsciously feel a rum aged for longer is somehow better – that’s a good rule of thumb, just not universally applicable, and here, whether it is that old or not, there’s no denying that for its price (still available at around three hundred dollars, same as the 1992) it’s a remarkable rum, made within the living memory of us rum collectors and Rumaniacs, and leading us by the hand into the misty times predating the iron rule of the AOC. The other boys in the Bally-house have also looked at the 1982, and you can find their comments in the usual spot on the Rumaniacs website. Leaving aside the independent bottlers, the agricolistas from Guadeloupe and Martinique seem to like producing a specific year’s output with much more enthusiasm than most molasses based rum producers, who (until recently) preferred to release specific “recipe-style” blends that changed little from year to year. There’s something to say for both ideas – consistency of taste over time, versus the individualism of specific date points – which just supports my thesis that even in writing about a social spirit, larger philosophical issues about our world can be discussed using them as an example. In this case, we’re not moving too far away from the Bally 1993 written about in R-042, but the price has definitely gone up (to over three hundred bucks) – and that’s even without knowing precisely how old the rums is, though I maintain that it, like its brother, is around 3-5 years old. Nose – It’s initially more hesitant in its profile than the 1993 (and the others), or perhaps just more focused. Both a strength and weakness, methinks. Salty molasses and caramel notes, green grapes, segueing over time into something darker, deeper: chocolate, cereal, wet cardboard. Some herbal, grassy notes, just not very clear. There’s also a musky tinge here, something like rain falling on very hot earth, and at the last, flowers, honey, biscuits. Actually reminded me of a miso soup. Palate – Crisper, saltier, cleaner. Something of a right turn from the way it smelled. Olives, guacamole, brakfast spices, and vegetables more so than the fruits (which came later). The cardboard and attic-level stuffiness and wet earth make a return bow. Some jams and citrus notes follow on but don’t claim the high ground from the vegetals. Not sure this entirely works for me. It may just be a matter of taste. Finish – Green grapes, cinnamon, brine, olives, avocados – it took time for the caramel and fleshy fruit to close things off. A bit too much wood here, I thought, though anise – sensed more than experienced – was a good background. Thoughts – More individual than the 1993, more oak, more vegetables, less fruits…somewhat less “rummy.” Bit of a schizo rum and didn’t have that little something extra that I would have preferred – still, that’s a personal opinion, and overall, it’s still a good dram for something so young. Some of the boys from the Rumaniacs have also taken a crack at this rum, and their reviews can be found in the usual spot. The first of six Bally rums (no relation to me), which we’ll also post faster than usual, since they are, again, part of a series. Let’s start with the most recent. For those who are interested in agricoles (which these assuredly are), J. Bally from Martinique has been around since 1917 or so (land prices after the 1902 eruption of Mount Pelee were low), but the sugar estate of Lajus goes back even further, to the mid-1600s. Alas, Bally has been closed since 1989, but their stills continue. 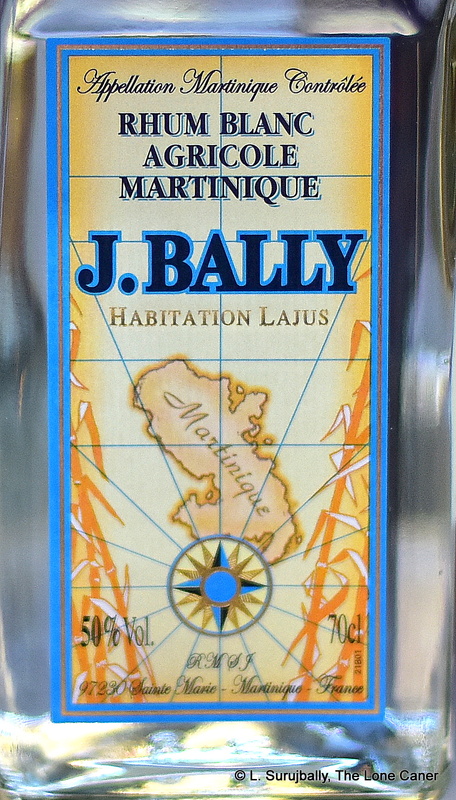 The Simon distillery now owns them, and supposedly the original recipe for Bally’s rums, and sugar from the original plantation, is used to ensure the brand does not die. And of course, the AOC certification is alive and well with these rums. True age is always a problem with these millésimes (meaning a specific year of production), because the date of distillation is noted….but not always the date of bottling. Since a “rhum vieux” is supposed to have a minimum of three years ageing, I’m going to say 3-5 years old, then. Nose – Quite solid, very smooth and, of course, crisp as fresh picked lettuce. Amazingly fruity profile here, prunes and raspberries to start, nicely rich and quite aromatic, adding bananas, honey, hard yellow mangoes (from India or Thailand), and coiling around the background of herbs and grasses…some spearmint chewing gum. And a touch of oak, cinnamon and caramel. Seems almost like a Guadeloupe rum, what with the way the herbal and grassy aromas take a back seat and fruits are this rich. Finish – Vanillas, burnt sugar, honey, sugar cane, grass, and a bit of that olives in brine thing I enjoyed. Somewhat hotter and sharper than what had come before, oddly enough. Thoughts – A young rum, and very enjoyable. Agricoles do have that trick of making stuff in the single digits take on molasses rums twice as old and leaving them in the dust. I still think overall it resembles a Guadeloupe rhum more than a true agricole (even though it is AOC certified), but whatever the case, I’m not complaining. Oh, tough one to research. Loads of 1929 and 1930s photos out there, rien on this one. Not a millesime, because J. Bally helpfully places the year on that little smiley label at the top for those. But with that fading old-style label, maybe pre-1980s? Earlier? Not sure. Still, J. Bally’s original domicile on Plantation Lajus du Carbet was closed back in 1989 (current rhums are made at a consolidated site at Plantation Simon using the original recipe), so at least we have something suitably aged here. Whatever. It was a neat little piece of history to be trying. Note the cheap tinfoil cap, which perhaps says something about the makers’ esteem for their own product, back in the day…makes a man happy for modern plastic. I spoke to the company history a little here. Nose – Heated, not sharp. Very fruity, dark stuff, at the edge of over-ripeness. Rich and fragrant and oh-so nice. Ripe peaches and plums; apricots just starting to go like an ageing strumpet past her prime; coconut shavings and a squirt of lime juice over the lot. Also a faint background of musky brininess and sugar, like tequila. Palate – Nice! Medium to full bodied, firm, warm and silky to taste. Dusty old books, dark sweet chocolate (RitterSport “rum, raisins and hazelnuts,” maybe that was it). More plums, plus some squashy blueberries, plus the taste of cumin and coriander and the same salt-sweet mustiness from the nose. All in all, very tasty, and had sufficiently heated silky mouthfeel to make it an pretty good rhum, even for only six years ageing. Finish – warm and lasting. Great black cake and tequila closing notes. Somehow they didn’t interfere with each other (not always the case). Thoughts – Wish I knew when it was made. Actually, I wish I had the whole damned bottle. Cool bottle, great product. Almost the perfect mid-range rhum, not too young to be raw, not too old to be over-pricey, or unavailable. 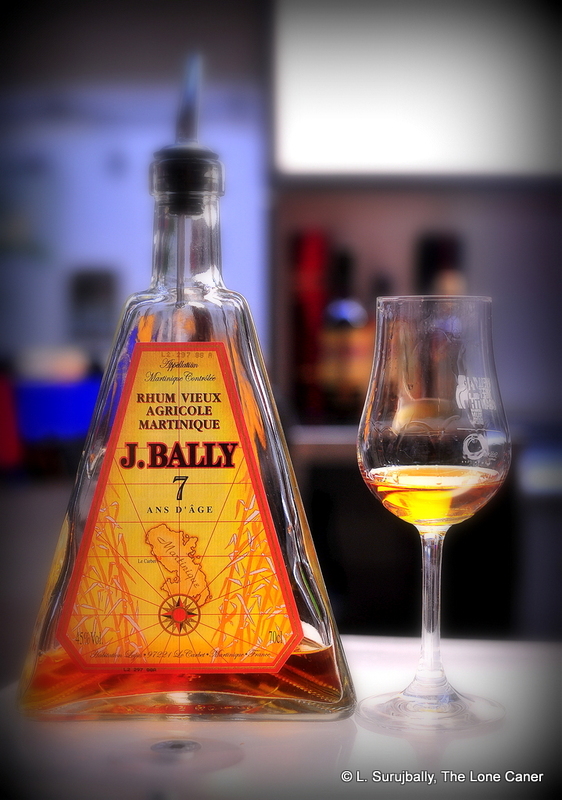 The zippy, funky young J. Bally Ambrè agricole was an interesting rhum from Martinique, and I enjoyed it, simply feeling it had some growing up to do – which is perhaps natural for a rhum aged less than five years. The Vieux 7 year old certainly addressed many of these concerns, and was a better rhum in almost every way. Ageing may not always confer quality (neither does price) I’ve heard it said, but I think the person who tries these two side by side would agree that the 7 is a step up the ladder of value. The rhum came in an enclosure that had all the panache of Mocambo’s Pistola, Nepal’s Kukhri, R.L Seale’s 10 year old or Don Omario’s star-shape, and seemed to reiterate J. Bally’s desire to be different (the Ambrè did too, remember?) – and I must admit to doing a double take myself when I first saw the pyramid-shaped 700ml bottle, so the effect has certainly not waned with the decades since it was first introduced. There’s a whiff of the nautical to it – in rolling seas, the tall slim bottle of the Clairin Sajous would be over the side in no time, but drunk or sober, storm or calm, this one would remain rock steady, ready for you to reach out from your hammock belowdecks and get your tot. Anyway, this was a rhum I savoured right alongside its younger brother, and appreciated even more. Goldish brown with reddish tints, it was aromatic right off the bat even from a few feet away on the initial pour. I immediately sensed soft flowers and cut grass, that herbal sap-like fragrance so characteristic of agricoles, and given the rhum was bottled at 45%, quite warm and easy going…quiet, almost. No aggro at all. I swirled my glass a little wondering if it would grow fangs, develop into something more intense, but no, it remained quite placid. Once I allowed it to sit around for a while, it opened up a shade, and the ageing became more evident, with background of oak and vanillas becoming more prominent, but never quite overtaking the herbaceous primary aromas. At 45%, it showed great technique – I’ve had forty percenters that were more raw and uncouth; it was an impressively smooth and warm drink, and could be had neat with no issues at all. It was heated and yet clear, even crisp. Although initially my perceptions were of briny notes alongside cheddar cheese on rye bread, cinnamon, burnt sugar, caramel, white flowers (creamy would not be out of place to describe it), these tastes subsided after a while, giving way to tobacco and vanilla and a faint butterscotch without ever being overwhelmed by them. Underneath it all was that breezy, grassy layer that melded well with what came before. And I really enjoyed the fade, long and clean, with lovely closing notes of fresh cut green apples, lemongrass and crushed cane at the factory. You might not think that works well with the vanilla background imparted by the ageing in oaken casks, but yeah, somehow it does. So…it’s a quietly impressive rhum that would find favour just about anywhere. With some drinks I have to be careful and state that a person who is just looking to start his rum journey might not appreciate it, or one who prefers his molasses might not like it. In other cases, the taste might be too raw, too funky, too out-of-left-field, too strong, even too original. Those who possess an A-type personality might prefer something else entirely. 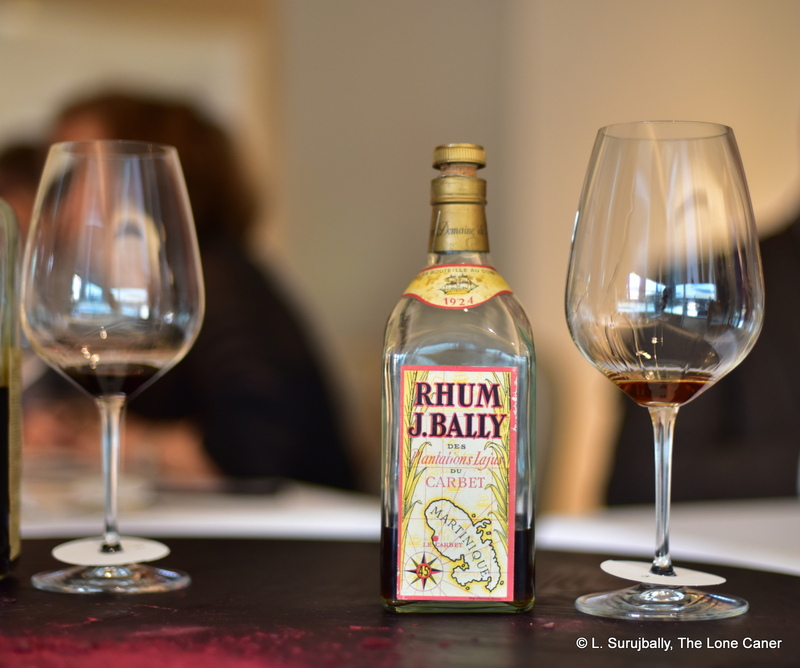 But here, J. Bally have provided a synthesis of all the things that make rum such a wonderful drink, something to appeal to the many without catering to any of them. There would be few, I believe — fan, starter, boozer, mixer, collector or connoisseur — who would not appreciate this very good all round seven year old rhum from Martinique. Thank goodness, too, because as soon as you crack the bottle and take your first sip, it’s going to be hard to stop at just a single shot. I sure couldn’t. I’ve spoken to the history of J. Bally in the Ambre review, for those who like the background filled in.